This is a free country. Nike can pick whomever they like for their ads. We may not like it. That’s fine; don’t buy their stuff. One veteran launched his own line of gear called Just Stand, a response to the ongoing controversy of athletes, and now even some public officials, kneeling during the national anthem. It’s disrespectful. Not illegal for sure, but don’t cry and whine when patriotic Americans take you to the woodshed. For many, they see the kneelers as a group of people disrespecting the flag, the anthem, the country, and our veterans—those defending our freedom to enjoy these various sporting events throughout the year. It’s also seen as a sign of disrespect to those who have been killed in defense of this great country. Liberals don’t see it that way. They’re getting frustrated that people don’t see it their way, which shows the minority view point that is American liberalism. Even New England Patriots fans felt kneeling was out of line, one fan actually agreed with Trump: the players kneeling should be fired. Colin Kaepernick, a former QB for the San Francisco 49ers, is one of the faces of this movement who was recently picked to be the face of Nike’s Just Do It campaign. It focuses on sacrifice—and how much it might cost someone due to his or her beliefs. It’s political. It’s meant to be controversial, and it was a huge middle finger to patriotic Americans. Again, this is America. 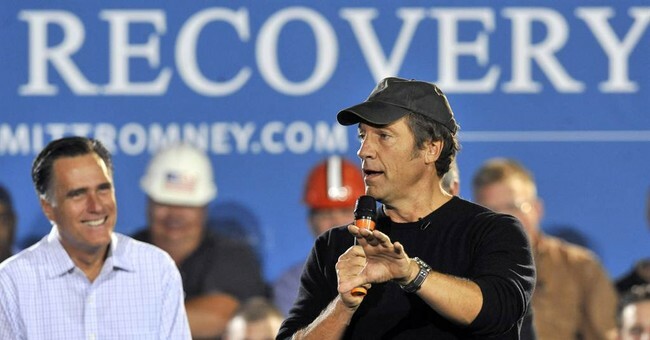 She’ll give you a helluva fight for what you believe in, but while some are rightfully angry about Kaepernick’s nonsense, there’s Mike Rowe, the television host who's famous for Dirty Jobs and Somebody’s Gotta Do It on Discovery and CNN respectively. He also narrates the Deadliest Catch series. Hi Sam. Nike's free to celebrate whomever they wish, and Kaepernick is entitled to his opinion - kneeling, standing, or lying down. But if I was going to put someone's face on a billboard - someone who epitomized bravery and sacrifice - I might have gone another way, especially this time of year. I might have gone with this guy - Tom Burnett. Tom's last act on earth was one of the most courageous things imaginable. And his last words to his wife, Deena, are among the most inspiring I've ever heard. Those exact words are at the top of this page, and the bottom. They were spoken seventeen years ago, under conditions I hope to never experience. I'll never forget Tom's last words. I hope you won't either. Deena: Tom, are you O.K.? Tom: No, I’m not. I’m on an airplane that has been hijacked. Tom: Yes, They just knifed a guy. Deena: Where are you? Are you in the air? Tom: Yes, yes, just listen. Our airplane has been hijacked. It’s United Flight 93 from Newark to San Francisco. We are in the air. The hijackers have already knifed a guy, one of them has a gun, they are telling us there is a bomb on board, please call the authorities. He hung up. 6:34 The phone rang in on call waiting, Tom’s second cell phone call. Tom: They’re in the cockpit. The guy they knifed is dead. Tom: Yes. I tried to help him, but I couldn’t get a pulse. Deena: Tom, they are hijacking planes all up and down the east coast. They are taking them and hitting designated targets. They’ve already hit both towers of the World Trade Center. Deena: Who are you talking to? Tom: My seatmate. Do you know which airline is involved? Deena: No, they don’t know if they’re commercial airlines or not. The newsreporters are speculating cargo planes, private planes and commercial. No one knows. Tom: How many planes are there? Deena: They’re not sure, at least three. Maybe more. Tom: O.K….O.K….Do you know who is involved? Tom: We’re turning back toward New York. We’re going back to the World Trade Center. No, wait, we’re turning back the other way. We’re going south. Deena: What do you see? Tom: Just a minute, I’m looking. I don’t see anything, we’re over a rural area. It’s just fields. I’ve gotta go. Deena: Tom, you’re O.K. (I thought at this point he had just survived the Pentagon plane crash). Deena: They just hit the Pentagon. Tom: O.K….O.K. What else can you tell me? Deena: They think five airplanes have been hijacked. One is still on the ground. They believe all of them are commercial planes. I haven’t heard them say which airline, but all of them have originated on the east coast. Tom: Do you know who is involved? Tom: What is the probability of their having a bomb on board? I don’t think they have one. I think they’re just telling us that for crowd control. Deena: A plane can survive a bomb if it’s in the right place. Tom: Did you call the authorities? Deena: Yes, they didn’t know anything about your plane. Tom: They’re talking about crashing this plane into the ground. We have to do something. I’m putting a plan together. Tom: Different people. Several people. There’s a group of us. Don’t worry. I’ll call you back. Tom: Where are the kids? Deena: They’re fine. They’re sitting at the table having breakfast. They’re asking to talk to you. Tom: Tell them I’ll talk to them later. Deena: I called your parents. They know your plane has been hijacked. Tom: Oh…you shouldn’t have worried them. How are they doing? Deena: They’re O.K.. Mary and Martha are with them. Rowe included a link to the foundation established in Tom Burnett’s honor. Its mission is to help young people become good citizens and leaders for tomorrow. It was one of Mr. Burnett’s principles that he lived by and hoped to instill with his own children.